What widths are available for flat wire belts? How long can a flat wire belt be? What materials can be used to make a flat wire belt? What is the difference between standard and heavy duty belts? What is the difference between clinched and welded selvage (edge)? What is the actual overall width of a flat wire belt? What is the difference between East coast pitch and West Coast pitch? Why must a flat wire belt have an odd number of openings across its width? Why are the number of openings across the width of a belt important? What is the smallest opening size for a flat wire belt? Can a flat wire belt travel around a turn? Must a flat wire belt be supported by some type of bed? What is the bore diameter tolerance for sprockets? Can Keystone cut non-standard keyways? Will sprockets for standard duty belts work with heavy duty belts? How many sprockets do I need on the drive shaft and tail shaft of my conveyor? Can Keystone produce custom sprockets? How do I splice (connect) a standard flat wire belt? How do I splice (connect) a heavy duty flat wire belt? Keystone flat wire belts can be produced from 3" to 240" in width, depending on the particular type of belt. Please see the belting specification pages for more information. A flat wire conveyor belt can be any length, however we normally package belts in 50 foot long rolls for easy handling. Flat wire belts can be made from C1015 galvanized steel, C1050 high carbon steel, T-201 stainless steel, T-304 stainless steel and T-316L stainless steel. Standard duty belts use a 0.120" diameter connecting rod with 3/8" high x 0.046" thick strip steel while heavy duty belt have 0.192" diameter connecting rods and ½" high x 0.062" thick strip steel. Heavy duty belts are approximately 2-1/2 times as strong as standard duty belts. A clinched rod is one that has been bent back into the outside opening of a belt on either side, mechanically locking the mesh to the connecting rod. A welded rod has been upset welded on each edge leaving a button head which locks the connecting rod in place. Both styles of belt are rated for the same strength and are priced identically. The choice between styles is mostly a matter of customer preference, although clinched edge belts are less likely to catch on the side of a conveyor or narrow under heavy loads. Welded edge belts wider than 24" have internal welds every other pitch in length to prevent this narrowing. Clinched and welded belts can be meshed together using a welded edge connecting rod. Often, the choice between styles comes down to delivery time. The overall width of a Keystone flat wire belt always will be 1/8" – 1/16" under the width specified. An 18" wide belt would be made between 17-7/8" and 17-15/16" in actual width (from end of rod on one side to the end of the same rod on the opposite side of the belt). East Coast pitch is 1.084" while West Coast pitch is 1.054". West Coast pitch is only for standard duty belts and Keystone does not manufacture belts with a West Coast pitch. Due to the limited availability of West Coast pitch belts, Keystone may be able to replace your belt and sprockets for less than the price of a West Coast pitch belt. Flat wire belts always have an odd number of openings for both production reasons and so that the trailing edge of the belt is facing away from the direction of travel, making it less likely to catch on the side of the conveyor. Even numbered openings across the width of a belt are formed by a die while the odd numbered openings vary to achieve a specified width. For example, a 1" x 1" mesh belt, 12" wide, will have 13 openings. The number of openings across the width of a flat wire belt will typically identify a belt with regard to width, mesh size and whether the belt is standard duty or heavy duty. Additionally, in order to mesh a new flat wire belt with an existing belt, the number of openings must be determined (always an odd number). If a belt is being replaced and sprockets are able to be moved on the shaft, the number of openings is not as critical. Keystone produces a ½" x ½" mesh, a ½" x 1" mesh and a 1" x 1" mesh (¾" X 1" mesh is available by special order) Other mesh sizes are not available due to the high tooling cost and long lead time associated with making the tooling. Yes, Keystone's Key-Turn™ belts will negotiate a turn, please contact our sales department for more information about these belts. A flat wire belt must be supported by a bed when loaded with a product, the belt moving along the return pass of a system does not always need to supported, please see Keystone's technical manual for more information. The bore diameter tolerance varies with the size of the bore, but is generally +.001" to +.003", slightly more tolerance on larger diameters. Common bores are checked with ground plug gages that are .0005" over the nominal diameter. Other tolerances can be provided on request. Yes, please consult the sales department. No, Keystone sprockets are specifically designed to engage with each belt. A sprocket for standard duty belting has thicker teeth and therefore will not fit into a heavy duty mesh belt opening. The sprockets for heavy duty belts will fit in standard duty mesh belt openings but will engage the rod incorrectly. 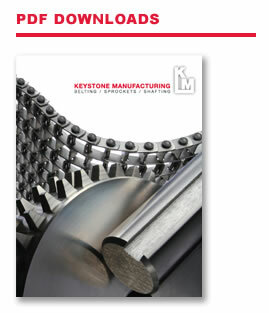 Keystone recommends a minimum of one sprocket for every 6" of belt width and then add an additional sprocket for the drive shaft, while one sprocket for every 8" of belt width on the tail shaft. Please reference the technical manual. Yes, please contact the sales department.